The University of Texas System Board of Regents has approved the design for a new University of Texas at Arlington Science and Engineering Innovation and Research building, a space that will support the significant growth of students in areas of workforce need and provide the basis for enhancement in research activity. The $125 million, modern glass and steel building will span 220,000 square feet and provide a new, iconic southern entry to the UTA campus, south of the existing Life Science building. The project will add 900 teaching seats in lecture halls and classrooms, which will support enrollment growth across campus, especially the planned growth in the College of Engineering, the College of Nursing and Health Innovation and the College of Science. “The SEIR building will enhance UTA’s capacity to meet the state’s need for the generation of a highly skilled workforce and intellectual capital while assuring that we continue to rise in reputation as an R-1 university,” UTA President Vistasp M. Karbhari said. “The approved plans support multi-disciplinary teams working in large multi-use, collaborative spaces and will foster the generation of new ideas and solutions to real-life problems. 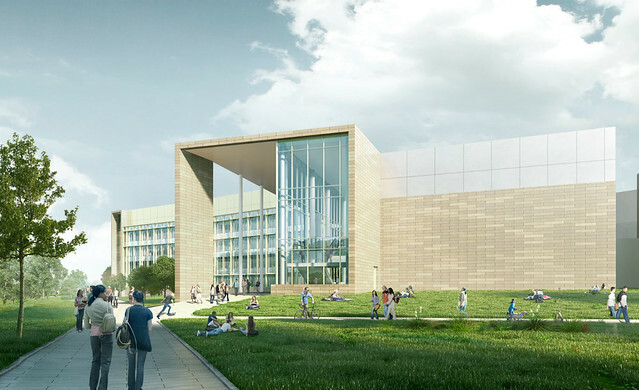 Construction of the Texas limestone, steel-and-glass structure is expected to begin this fall with substantial completion in summer 2018. The building is designed in accordance with sustainable practices, with high energy-efficiency heating and cooling systems, water conservation practices and sustainable materials for flooring and interior finishes. The construction manager is Hunt Construction Group, Inc., who previously managed the construction of UTA's College Park Center. Designed by Page and ZGF Architects, the SEIR building includes a four-story wing with a basement level for research laboratory use and a two-story, instructional classroom wing that also can be adapted to host conferences and workshops. Each floor of the instructional wing incorporates a 150-seat and 300-seat classroom, both intended for general campus use for larger core courses. A key design aspect is glass interior walls enabling work in the collaborative lab space to be visible to first-year students – a concept called “science on display,” said Duane Dimos, UTA vice president for research. The research laboratories include areas for research focused on the health sciences. A dedicated core laboratory neighborhood space is located in the basement and designed with a vibration-resistant structure to house highly sensitive research equipment. The SEIR building will have a long-term, positive economic impact on North Texas, UTA leaders said. Such facilities are critical to the state’s ability to produce greater numbers of degreed adults in high-demand fields, including engineering, science and health care. The project marks the next phase in UTA’s growth in the health science arena and toward advancing discovery and innovation in the area of health and the human condition under the Strategic Plan 2020. In the past year, the University has attracted world-renowned kinesiology and nursing researchers supported by the National Institutes of Health, the American Heart Association and the National Institute on Aging, among other funding sources. The College of Nursing and Health Innovation has been named a National League for Nursing Center of Excellence and is launching a new doctoral program in kinesiology as well as an undergraduate track in public health. UTA has recruited Michael Cho, a well-known researcher with interests in brain injury, as chair of the Bioengineering Department in the College of Engineering. In late 2015, Cho won a $1.24 million Office of Naval Research grant to study how shockwaves on the battlefield injure soldiers’ brains. Kinesiology professor Paul Fadel, the new director of clinical translational science for the College of Nursing and Health Innovation, last month won a four-year, $1.7 million NIH grant to develop a treatment to lower sympathetic nerve activity and blood pressure in patients with chronic kidney disease. Other expanding areas of UTA heath science research that will be based in the SEIR building include new approaches for drug development that take advantage of natural immune responses; diagnostic approaches that effectively treat neurological issues such as Alzheimer’s disease and traumatic brain injuries; research to understand health issues associated with the hearts, kidneys and other organs; and evolutionary biology to learn how changes occur that can cause adaptation or disease. The University of Texas at Arlington is a Carnegie “highest research activity” institution of more than 52,000 students in campus-based and online degree programs and is the second-largest institution in The University of Texas System. U.S. News & World Report ranks UTA fifth in the nation for undergraduate diversity. The University is a Hispanic-Serving Institution and is ranked as the top four-year college in Texas for veterans on Military Times’ 2016 Best for Vets list. Visit www.uta.edu to learn more, and find UTA rankings and recognition at www.uta.edu/uta/about/rankings.php.